Aeration is the process of reducing soil compaction by removing hundreds of small cores of earth (about the size of your finger) and depositing them on top of the lawn. The resulting holes provide the BIG benefits to the lawn. After years of foot traffic, child’s play, and other activities on your lawn, the soil becomes very hard and compacted. Compacted soils don’t leave much space for roots to grow. I’m sure you can appreciate that it’s next to impossible to have a lush lawn when the grass roots are struggling for room to grow! So aeration relieves the compaction and makes room for the roots of your lawn to thrive! All the holes punched in the lawn have another interesting benefit. You see, Kentucky Bluegrass spreads by growing “rhizomes”. These rhizomes are a special kind of root that grows horizontally just under the soil surface and may grow several inches or more from the mother grass plant. At some distance from the mother plant, the rhizome naturally sprouts a new baby grass plant. When these rhizomes are severed, as aerating does, many new young grass plants sprout up from the ends of the cut rhizomes! What a great way to rejuvenate an old lawn! By providing a healthier environment for your grass to grow with regular aerating, you will also improve your lawns resistance to diseases. I bet you’re asking yourself…how often does this need to be done? Well it really depends on your particular lawn. 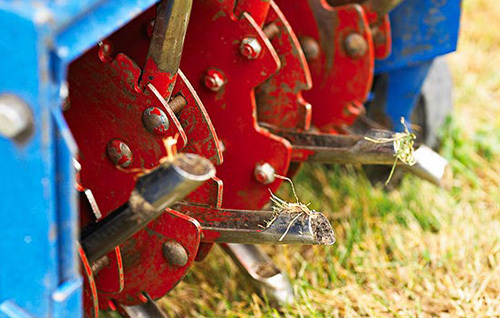 Golf courses aerate the greens at least twice each year! But for most home lawns with average usage, aerating every second year is recommended.